Pure Digital Technologies, makers of the popular Flip line of pocket camcorders announced today the release of two new pocket camcorders—the Flip $149 UltraSD and $200 Flip UltraHD. 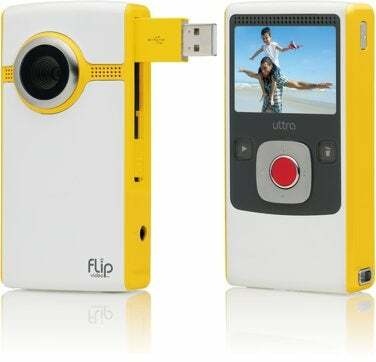 The Flip UltraSD shoots up to 2 hours of H.264 standard definition video at a resolution of 640 x 480 pixels and average bit rate of 4Mbps, bears 4GB of non-removable internal storage, runs off of two AA batteries, and is available in black, white, yellow, and pink. Like previous Flip camcorders, the UltraSD includes a composite video port. The Flip UltraHD is an 8GB (non-removable) high-definition camera with a resolution of 1280 x 720 (720p) that also shoots up to 2 hours of H.264 video at an average bit rate of 9Mbps, includes an HDMI port for connecting the camera to an HDTV, and is powered by two AA batteries (a AA battery pack that can be charged via a powered USB connection is included). The UltraHD is available in black or white with chrome sides. Both cameras have a 2-inch (measured diagonally) display, offer a 2x digital zoom, and feature a trademark flip-out USB connector. As with other Flip camcorders, Windows- and Mac-compatible versions of Pure Digital’s video-editing and distribution software, FlipShare, are preloaded on the cameras’ storage media.